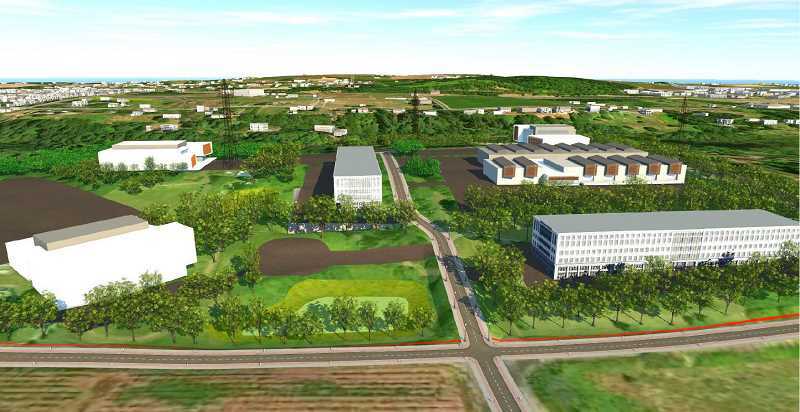 In the coming years, once development in the Coffee Creek industrial area is cemented, Wilsonville City Manager Bryan Cosgrove said the Basalt Creek planning area will be the City's preeminent focus for bolstering employment options. And, last week, Wilsonville earned a notable victory that representatives believe will help maximize the undeveloped area's value. In resolving a dispute between Wilsonville and Tualatin over whether to designate the central subarea — a 52-acre parcel slated to be located in Tualatin and on the edge of the Wilsonville border — industrial or residential, the Metro Council sided with Wilsonville by mandating that the area be zoned for industrial use. Metro Chief Operating Officer Martha Bennett first recommended that the Metro Council designate the land for industrial use and the Council approved her recommendation at the Metro Council meeting May 3. "The area is close to Interstate 5, has good existing and planned transportation infrastructure, including the Basalt Creek Parkway, consists of relatively large parcels, and is in close proximity to other areas planned and developed for employment uses," Bennett wrote in her recommendation letter. Now that the issue is resolved, Wilsonville and Tualatin will develop concept plans for the area over the next four months and the two city councils and Washington County will then need to formally adopt the plans. The two cities will eventually annex land in the area — which currently resides in unincorporated Washington County. "The significance (of the decision) is that the rest of the concept planning can now go forward and position the Basalt Creek area to be available for annexation into either Tualatin and Wilsonville and we can move forward in trying to create opportunities for employment growth for both cities," Wilsonville Mayor Tim Knapp said. "They made a decision it's going to be jobs and we're just thankful a decision's been made and we can move forward," Tualatin City Manager Sherilyn Lombos said. Tualatin and Wilsonville initially verbally agreed to the Basalt Creek Land Use Map but Tualatin changed its mind after residents spoke out against the zoning designations. Tualatin then determined that the area was more suitable for residential development than industrial development due to its slopes and rugged typography. Because Wilsonville and Tualatin couldn't agree on a zoning designation for the area, the cities allowed Metro to arbitrate the dispute. "Our argument was based on the fact that typographically it's a very challenging area but Metro made the decision and we're moving forward with the concept plan as if it's job land and we'll see what happens moving forward as far as development applications," Lombos said. Metro expanded the urban growth boundary in 2004 because the employment land in the area was not sufficient to meet projected needs over the subsequent 20 years and Basalt Creek accounted for nearly one-third of the added urban land. And Wilsonville pointed out during the arbitration process that if the central subarea was designated for residential development, 65 percent of Tualatin's developable land in Basalt Creek would be designated for residential development. "From the WIlsonville point of view, our proposal is authentic in honoring the original reasoning that that acreage was added to the urban growth boundary as necessary for jobs in the south-metro area and we're trying to find ways to facilitate that," Knapp said. Cosgrove said a residential designation in the central subarea would have hindered Wilsonville's ability to attract employment in Basalt Creek. "We argued that it would impact our ability to attract employment because you want complementary land uses across from each other," Cosgrove said. "(And) that the Basalt Creek Parkway was for employment uses and putting a bunch of residential trips on that parkway was not the best use of the facility." Cosgrove said that, although the area is imperfect for development, it is suitable for employment and portions that might be untenable could be used to provide amenities such as trails. "I've seen plenty of developments for offices and employment uses that are built on slopes and terrain and you're going to have to put a road in whether it be residential or employment," he said. And Bennett agreed with Wilsonville's argument that the area is amenable to certain kinds of industrial development. funded by Washington County and Wilsonville respectively), such as office, flex business park, manufacturing, and craft industrial," Bennett wrote. Bennett also said that the industrial development designation more smoothly aligns with Metro's transportation plans in the area and that Wilsonville acquiesced to Tualatin's request to allow Tualatin a larger portion of land in the planning area under the presumption that the central subarea would be designated for industrial development. "Given Tualatin's push to move the boundary south in order to provide itself with more employment land, there was no reason for Wilsonville to think that Tualatin was going to change its proposed employment designation for the central subarea to residential," Bennett wrote. For Tualatin, Lombos said the City already had plans in case the area was zoned for industrial use and that the decision won't significantly affect their overall planning. "It doesn't change anything. It just solidifies that we can finalize the concept plan and we know what the land uses are going to be," she said. Knapp said Basalt Creek affords Wilsonville flexibility in providing innovative employment opportunities down the line. "If we insist on immediate development of all land at today's level of technology and needs then we will have very little remaining for those future needs," Knapp said. "Part of our responsibility is to plan further ahead and plan opportunities that are preserved not only for today's needs but for future needs and I see this area as desirable and unique in some ways because of the natural setting in that area."